Max Restaurant Group congratulates Michael Corcoran, who has worked for many years at Max Amore, for this distinguished award. He is set to receive this award on Saturday, April 28th, 2012 at the Earth Fair at the Connecticut Audobon Society Center at Glastonbury. Since 1997, Connecticut Audubon Society Center at Glastonbury has awarded the Environmental Excellence Award to honor companies, groups and individuals in Glastonbury and surrounding communities who demonstrate responsibility and integrity towards the environment. This year we are very pleased to present the 2012 Award to Michael Corcoran, a man dedicated to conservation and environmental issues, as well as, sharing his knowledge of native plant habitats and our breeding birds. 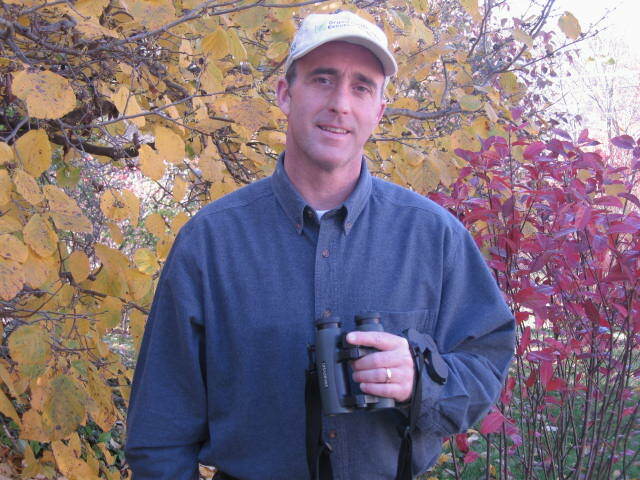 Over the past 20 years, Michael has participated in numerous citizen-based bird population studies. A Connecticut Audubon Society volunteer since 1994, Michael has helped maintain the bird banding station at the Birdcraft Sanctuary in Fairfield, CT, the oldest privately owned bird sanctuary in the country. He has also traveled to Costa Rica, as part of a CAS bird banding team, participating in the San Vito Bird Club’s Avian Monitoring Project, an on going, collaborative initiative, exploring winter habitat use among migratory bird species in southern Costa Rica’s Pacific highlands. As an environmental educator, Michael’s passion for migratory songbirds has him teaching classes, and lecturing throughout our State, advocating for the restoration of the native plants our birds rely on to the suburban landscape. Recognizing the important role birds play in our natural systems, Corcoran shares his knowledge of how to use native plants, trees and shrubs to create safe havens for our breeding birds and to provide migratory birds ‘stop overs’ during their seasonal movements. He also practices what he preaches, in his own 3-acre property in South Glastonbury, where he has recorded a list of over 125 different species, including uncommon species such as the Bay-breasted and Blackburnian warbler, Olive-sided flycatcher and Northern shrike. Mr. Corcoran is a 2011 Coverts cooperator with the University of Connecticut’s College of Agriculture and Natural ResourcesForestry Extension. The Coverts Project promotes sound forest stewardship practices for wildlife, clean water and forest sustainability and it advocates for the management of grassland, scrubland and young forest habitat for wildlife on Connecticut’s private lands. Last June, Michael was very involved with the Glastonbury Partners in Planting and the Nature Conservancy’s Connecticut River program, where he helped plant Dutch Elm disease-resistant Elm tress and silver maples along the CT River flood plain to help promote sustainability and the restoration of the American Elm. It is with this environmental dedication and education contribution to the community that we feel Mr. Corcoran is most deserving of the 2012 Environmental Excellence Award to be presented at 1:00 p.m. on April 28th. The ceremony will be part of Earth Fair, a celebration of Earth Day, held at the Connecticut Audubon Society Center at Glastonbury, 1361 Main St. Michael has spent most of his adult life sharing his love and knowledge of the natural world by passing along what he has learned about creating a more bird-friendly landscape, our forests, our bird-life and their conservation to the general public. We look forward to recognizing his devotion with this award.